I have been dreaming about knitting this project for a long time, well since my knitting group and I knitted a baby blanket consisting of Lizard Ridge squares for one of our members. Which really when you think about things, must be nearly a year ago. Having finished my cardigan I was at a stage where I could think about what big project I wished to start next. I was just fine tuning between two cardigans that I would like to knit, when photographs such as these.. Lizard Ridge Squares and More Lizard Ridge Squares came tumbling out of the ether. They are from my good friend Knitted Bear who was a coconspirator of the baby blanket and who I used to share a hearty and slightly deranged giggle with about the beautiful colours. Aren’t they beautiful. And I knew they were, but I still thought to myself that I could do with another cardi before a blanket. And then, I was in a wool shop on Wednesday, I was just there to choose a button and that was all. To be absolutely honest, I was there on the Pretext of choosing a button, I was actually there trying to escape housework. As I wandered pausing gently to admire the yarns, I had this out of body experience. It started with colours before my eyes and then the colours became closer and brighter and you could feel the warmth and somehow softness of these colours. There were voices commenting about how pretty the yarn was and then suddenly a bag was thrust before me and I was on the way home with four balls of Kureyon Noro. I found the pattern and cast on. There was a slight problem with this ball, there was a knot and a huge amount of turquoise on the inside of the ball, as I had started with the outside of the ball this was going to cause a problem. So I fudged it and just wound those bits off and may use them later. This is 173 Lot D.
The magic, it is strong. 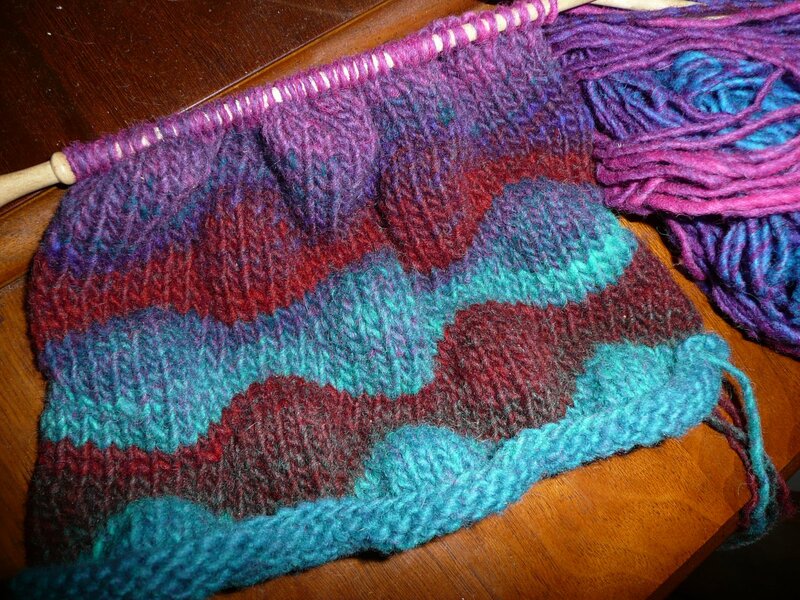 It’s very pretty – laughs evil chuckle!I found it easiest to knit from the centre of the ball first and then you can see whether you need to wind a bit off the outside to get a clear colour change or not. Enjoy!